Ah never mind Binny, I found it in show_survey.php. Thank you for a great plug-in ! There’s one thing that would ‘fit’ your plug-in… when ‘focusing’ on the user-answer (with a radio/checkbox in front)… the checkbox/radio should automatically get ‘checked’ without the user’s input. Thanks – I made the change – it will be there in the next version. On my site, only logged in users see the posts that have surveys. I’d like to make it so that the login information is captured (instead of people having to provide it) and that they only get the survey once. Can you point me in the right direction for making these changes? I would like to export the data as a CSV file, however, it is exporting as a PHP file. The software even asks to export as a CSV file. Please help. Thanks! how can I add the survey in my sidebar? What the PHP/HTML code for it? “Export to CSV” link doesnt work for me – i go to ‘see all answers’ then ‘export to csv’ and it just gives me text on a web page… can anyone help me get around this and export to excel? I don’t even have a CSV export link, button, or anything related to exporting the data. I am using the latest version of the plug in. Where would I find the export feature? Without the export feature, this plug in is not very useful to me. With the export feature, the plug is off the charts killer. Thank you. I hadn’t filled out any date for a survey, but now that I have the export link appears. Ok, when I click on export I get a php file not a csv file. I’m guessing that you want to have people select all and then paste into notepad? When I view the survey I’ve created in the Firefox, Opera or another browser it looks fine. When I switch to Internet Explorer not all the questions are displayed and the Submit-button is gone. This prevents people from submitting their answers. How can I fix this? Can you please confirm whether or not IP addresses or cookies can be tracked to ensure the same person doesn’t keep voting? I can’t manage to get more than one survey to show up at a time? If you click “submit” on one, it submits them all. Help? Great plugin. You can’t imagine how much it has helped my website.Thank you so much. I’m not much of a programmer but I was wondering about a few things. 1) Adding a more secure “captcha” submit button. 2) I’m always worried about hackers and spam. Can the submit form ever be used to gain access to my website. One question. Is there a way to have the survey appear within a page and not a post? I have a client who is wanting a Members’ Survey page (not a post), and inserting the [surveyname] in the page HTML simply returns “[surveyname]”. I wanted to post up the question to see if there is a quick fix before I delve into the code. You are using the wrong code. You should use [SURVEYS 1] – 1 being the id. Actually, that is the code that is being used. When [SURVEYS 1] is entered, that is what is displayed when it is pulished. No survey, just the [SURVEYS 1] call. Additionally, if I set up a new page or post with the [SURVEY 1] call, the survey will show in the preview, but will not display once the page or post is published. Found the issue. There is a plug-in conflict with Wishlist Member. Any ideas for a solution? Were you able to find the solution? Nope. No luck on finding a solution. Let me know if you find one. I appreciate how easy it was to set up. I do have a feature request, if it’s simply to incorporate. I’d like to be able to send someone to a “thank you page” of my choice, so I can give a little “thank you gift” when they are done. And, of course, I’d like to be able to choose it for each survey and not globally. 🙂 Thanks for the great plugin! This looks like what I’m looking for. My question is, if visitors want to see the survey results, is there a way that they can see the data, (Like 12 people answered questions #3 yes) or is it only viewable to the admin? I’d like to have everyone who takes the survey see the results- like the silly surveys that keep going around facebook… Thanks for your help! Hi, same question for me. How showing results to visitors ? It’s a great plugin, I like it very much. Just have one question on it , that can I output all the questions in one ‘page’ without the [next] button? It’s OK if it’s not supported currently. Its possible. Go to admin > Settings > Survey Setting. Then set the number as 0. We installed the survey plugin today and it’s installed and activated successfully, and we were able to create a survey using the survey manager, but nothing appears on the web site even with [SURVEYS 1] entered. We’re using the WP Remix theme. Does anyone know why the survey doesn’t work? Is there a certain place it’s supposed to be placed? Waiting for help! How can I place a certain survey in the sidebar? That’s not possible in the current version of the plugin. Found an issue on responses.php that some of responses doesn’t have a color assigned in “Votes” column. can you look into nextColor() function? is there a way to put images in the question? it looks like it should work, but the image doesn’t appear. A number of people have asked about inserting images into the ‘Surveys’ plugin. I have tried out most of the WordPress plugins, and none seem to be able to do this. When images are added to the ‘Surveys’ plugin, the html code seems to be corrupted and the image will not display. However, I have found a workaround. If you install another widget (widget logic), it becomes possible to use the sidebar to display the images. Widget logic gives you control over which images appear in the sidebar in each page. I have used this on my site, and I now have the survey questions with the appropriate images next to them. Sorry, I forgot to mention – great plugin, and thanks to binnyva for providing it. I have a client who wants to use the quiz as a method for collecting members. Is there a way to have the sign up form (opt in form) be placed after the quiz page but before the answer page? To see their answers users would need to create an account. Dear Binny,, I like your plugin and I started using it after adding some touches on the code. I only changed few lines here and there, as I’m not a PHP developer in the first place. I will be more than happy to send you the changes I made to include them in a future version, if you like them. If anyone is interested to try them, just check my blog (blog.sakka.me). 4) New button added “Back” to navigate back in questions pages. 6) Fixed: now “submit” button is no longer displayed with “next” button,, only displayed in the last question page. 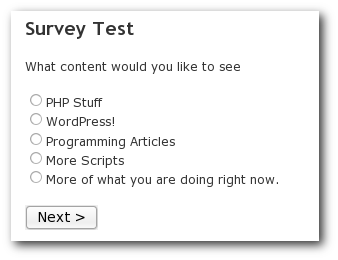 Your plugin is best about survey plugins for WordPress. But, when you answer questions, anytime you can submit survey. Therefore, survey is missing in half. You can make that “Submit Survey” buton appears end of survey. I like the idea of this plugin but I cannot get it to work! I have inserted the comment [surveys 1] and and but none of these present the viewer with an option to fill in a survey? What I am I doing wrong? How can I get rid of the text after the survey is submitted? “Hi, There is a new result for the survey at /whats-new/feedback/… Thanks for taking the survey. You input is very valuable to us. I just went in and changed the text in the source and removed the form. Also, part of the email message was getting outputted to the screen because printf was being used instead of sprintf, so I changed that also. There should really be a way in the options to change the text that shows, and an option to turn the form submission off too. I have been looking around in the source to change this too, but cant find it… In which file did you do the changes? It is in the show_survey.php file. Hi, I love your Survey Plugin. Is it possible to have the Answers next to the question as opposed to the Answers going below the questions? Wow, this is so great. I had to use related post plugin for years before reading this article. Thanks for sharing 🙂 You made my day. Does this survey plugin has the option to create a rating question – e.g. rate the following on the scale of 5 etc….. 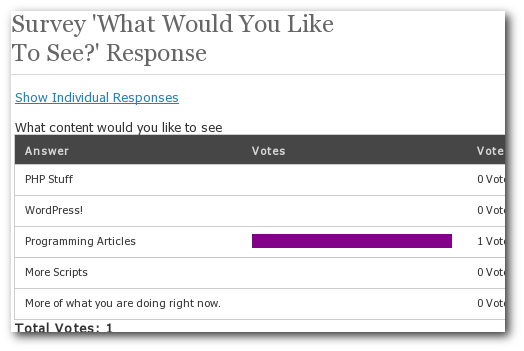 I used your surveys plugin in my previous wordpress blog site and everything was working perfectly. I created a new blog site today, and installed your surveys plugin. Everything was working fine, except “Export to CSV”. Whenever I clicked “Export” button in Export_choose page, I got HTTP 404 error. Is there anything I need to do prior to install the surveys plugin? The only difference I can tell between two blog sites is the old one wordpress version is older and the site I created today is version 3.0.1. Hello, this plugin does what i need, but i want to change the language to dutch. I found the default.po file and made a translation to dutch with a po-editor. the mo-file i called nl.mo but this is not making show the dutch language. In my config file i have “nl” lang configured what makes my site show in dutch. Thanks for a great plugin – will you be developing this further to include different types of survey questions (text, paragraph, checkboxes, grids etc)? How can I show the results in a page? Is there any simialr style code, something like [survey-1-results] that I can place on a page to have the results show? Thanks. I get a page not found error when i click on the export button on the choose export page. i know that all pages are there but still get this error. Any update? Same here. Using 3.0 and export to csv doesn’t work. I’m guessing this first line doesn’t work on 3.0? Great plugin by the way. I was having the same problem, primarily with Firefox ,and thought the link to wp-blog-header.php was to blame too. It’s quick and dirty but it seems to be working for me . I added a textarea but when someone is filling out the survey the text stop after X amount of words… How can I fix that? Hello. How do I make the jquery work to check if the user has selected an answer before going to the next page. It doesn’t seem to work in mine. It just goes to the next question/page, even if I did not select an answer and click “Next”. Could be a conflict with any script that’s used in your theme. Could be. Great plugin but if i refresh the thank you page, i can keep voting. I’m suprised there is no ip or cookie tracking to prevent that. Anything you can do ? Because i don’t see how you can trust the results if you know people can easily cheat. I would like to have ONE QUESTION per page. I have just downloaded the plug-in and I noticed that i can’t export the results. When I press export, it shows me an error url. Is there a way to show the name and email of the responder on the notification email? Now it just shows the results. I am new to wordpress. I tried adding a survey on our website. The survey is created in Tools->Manage Surveys, the code property for this survey is also showing SURVEYS 2. It is not showing survey into my post. I dont know what is missing? When I open this survey post in Mozilla, on status bar is shows done. what’s the problem here?? Any idea?? I’m planning to add that feature in one of the future releases – but currently, have very little time to work on it. Buy yeah – its on the todo list. I would like to translate some notification text to dutch. But when I change the text in the language file nothting happens. This is a great plugin. But, I am having a problem with exporting to .csv. I am using WordPress 3.1 and everything is running OK with the plugin until I come to export to .csv. I am getting a 404 error: The webpage cannot be found. The url looks like: (http//?????????? ?.com/wpcontent /plugins/surveys/export.php). Can you give me any solution. Can anyone tell me a simple way to get the export to csv to work? This is a great plugin but if I can’t export the data I can’t use it. Survey plugins - which one to choose?